At the tail end of January I escaped to the North. 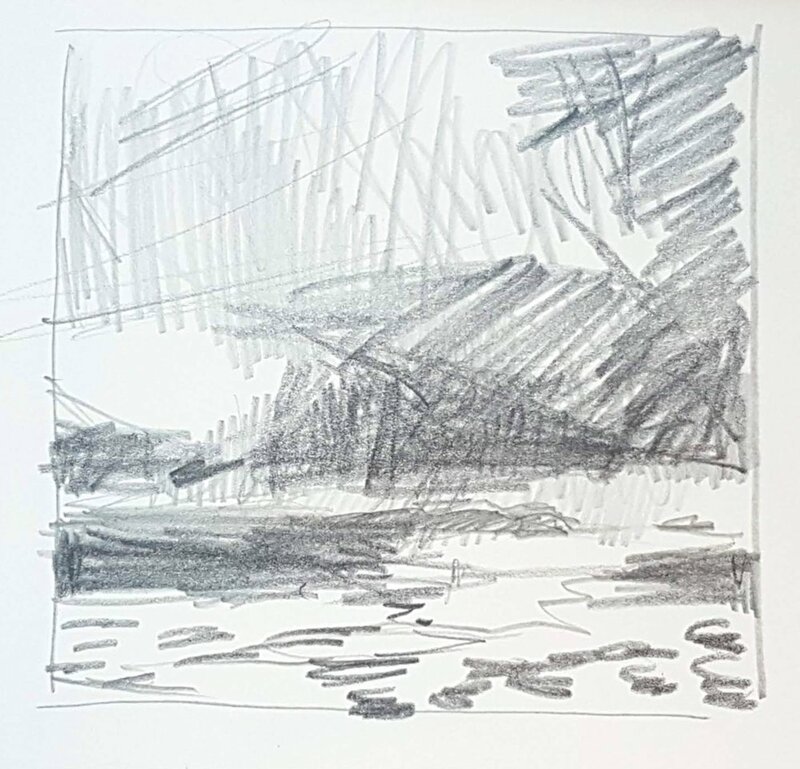 I spent five wonderful days exploring the Assynt Peninsula, drawing and walking. A planned research trip can often come with expectations that potentially won’t be fulfilled, but I was not disappointed. The weather behaved. By that I mean it was wild, cold and snowy. The light changed every few minutes. Just perfect for my work. My winter visit also meant there were very few people around. I found the quiet and solitude needed for the natural world to sink in. Sketchbooks were filled and words were written all in preparation for new work when I returned home. Research trips are essential to progression. To put it simply they are inspiring. I am often happy enough with staying closer to home but a completely new place opens up new ideas. The mind can find new ways to make marks and can lead you away from your usual perhaps comfortable colour combinations and inspire to try new ones. Compositions can be explored. The rocks, the beaches and the hills felt fresh and exciting since I am used to seeing the eastern vast stretches of sky and sand. Mark making changes accordingly. It is necessary to take your time, a day would not be enough to soak the landscape in. I was reminded of Jon Scheuler’s work as the weather wraps itself around you and seeps into every pore. Being in the landscape is essential for me. I don’t wish to just observe but to experience the weather that nature decides to throw at me. Hail, snow, freezing winds and brilliant sunshine. I love it all. My days took me to Alchiltibuie via the multiple stopping points and vistas. Achnahaird was wild and well worth the drenching I got whilst walking to the beach. Trips further North and through deeper snow revealed deserted roads and windswept beaches. The colours were magnificent set against the cool snow white shades; Slate Greys, peat bog browns and blacks with occasional glimpses of the hopeful translucent sea blues and greens. This was the true Scotland. With a solo show to prepare for I was in full flow, translating ideas and experiences into marks, paintings and writings. Consumed and happy I immersed myself for five days in painting the landscape. My forthcoming show ‘IMMERSE’ will be at Tatha Gallery in June. I am delighted to be showing in an Exhibition at Tatha Gallery alongside artists Kate Downie and Paul Furneaux. It was featured in the Dundee Courier and the Glasgow Herald on the 22nd June. A wee corner of my open Studio.